Celebrate The Best Toys for Kids 2013 with ASTRA! We work with some big brands here on Lille Punkin', but - the truth is -- we LOVE seeing new and innovative ways to play, no matter how big the manufacturer or store is. 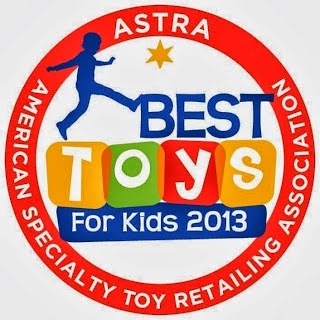 In fact, when we partnered with non-profit ASTRA (American Specialty Toy Retailing Association) last year to share some toys, it was one of our favorite posts of 2012. This year, we were asked to share some favorite toys for 2013, and we coudn't say NO! learn and play by doing 185 exciting projects involving sound. It even has a voice changer! RingStix Lite - We haven't had the kind of weather that allows us to play this yet, but I love the idea of this active game for getting kids outside and doing something! Toss the ring between two sticks and give kids a reason to use up that big front yard! I can see this as a great team-building exercise that helps develop hand-eye coordination and encourages physical fitness. Wanna Win? ASTRA is celebrating the I Heart My Neighborhood Toy Store campaign by giving away some AMAZING goodies. Just visit this link to enter. You have until November 8th to get your entries in! Prizes include a family getaway and, of course, lots of toys! *Samples were received to review and share. Opinions are 100% my own.